Under the 19' 0" awning, your family will stay cool in the shade when they're outside! This RV has a hitch weight of 3665 lbs. and GVWR of 20000 lbs. 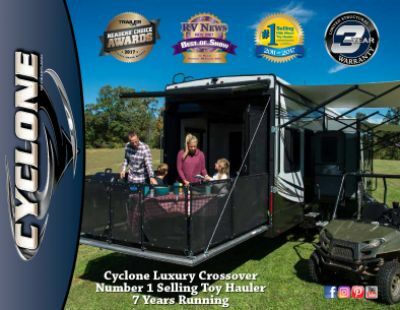 The Cyclone 4007 is big and roomy, and will feel like a home away from home when you're camping! That's because it's a generous 44' 0" long and 8' 5" wide, with 2 slides that maximize your living space! When it's sizzling hot, the modern 15000 BTU a/c unit will keep the family cool and fresh; and when it's cold, everyone will be toasty and warm, thanks to the efficient 35000 BTU furnace! Families as large as 7 members will enjoy great sleeping accommodations. You'll especially love the comfort of the King bed in the master bedroom! When you're on the road in the Heartland Cyclone 4007, you won't have to settle for campfire snacks or fast food to feed your family or guests. This terrific Toy Hauler comes with a fabulous kitchen, complete with a 3 burner range cooktop, 18.00 cu. ft. refrigerator, and other modern appliances! And clean-up is a breeze, thanks to plenty of hot water from the big 100 gallon freshwater tank and generous 60 lbs. of LP tank capacity! Even after days on the campground, you can enjoy a hot shower thanks to the heat provided by 60 lbs. of LP tank capacity! The bathroom has a convenient Porcelain Foot Flush toilet, and dirty water is sent to the 98 gallon gray water tank and the 80 gallon black water tank. There is a big 13' 0" garage and a rugged cargo capacity of 3332 lbs! Do you love to cook outdoors for the family in the fresh air and sunshine! You can do it every day thanks to the outdoor kitchen! Whether it's an early morning breakfast or a mid-day lunch, you'll whip up any meal easily and enjoy that great outdoor flavor! This 5th Wheel Toy Hauler has 'lofty' ambitions - with its roomy loft sleeping space built above the living space! At the end of the day, kids or guests will climb up and cozy down, comfy and secure, and drift off to dreamland in no time!